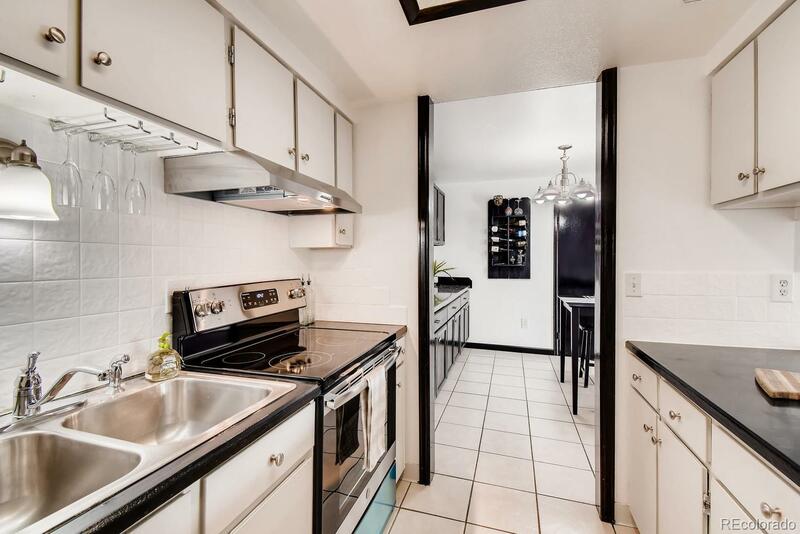 Centrally located condo with private washer/dryer hook-ups IN UNIT, two beautifully updated slate bathrooms, master walk-in shower, updated kitchen with all new stainless steel appliances, refinished counter-tops, new vinyl plank luxury flooring throughout. Conveniently located one block from RTD off I-25. HOA covers access to rec-center complex including gym, pool, fitness center, library-free WiFi, park playground, pond, and BBQ area. HOA covers water costs, snow removal/lawn, common area maintenance & exterior maintenance including balcony! End unit with no upstairs neighbors & your own private balcony. Brand new stainless steel kitchen appliances including dishwasher, range, range hood & side by side fridge valued @ $3500.00 conveys with property. Updated sliding glass closet doors, guest room queen size Murphy bed, built in storage and shelving throughout. Unit faces East courtyard for a quiet, cool summer breeze. GREAT investment or first time home buyer property. Association Name Primary: Harmony Management Group Inc.